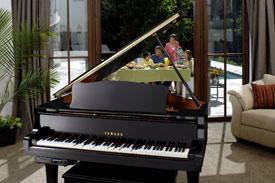 Yamaha will show off its latest Disklavier E3 series at Winter NAMM. The three “E”s stand for easy, enjoyment, and elegance, and encapsulates what this more entry-level digital piano is all about. Many of the Disklavier functions are present, such as recording and playback and whisper soft playing, 450 built-in songs and Internet connectivity. This connects the user to DisklavierRadio and DisklavierMusicStore.